Description: A life hanging in the balance . . . a family torn apart. The #1 internationally bestselling author Jodi Picoult tells an unforgettable story about family secrets, love, and letting go. In the wild, when a wolf knows its time is over, when it knows it is of no more use to its pack, it may sometimes choose to slip away. Dying apart from its family, it stays proud and true to its nature. Humans aren't so lucky. Luke Warren has spent his life researching wolves. He has written about them, studied their habits intensively, and even lived with them for extended periods of time. In many ways, Luke understands wolf dynamics better than those of his own family. His wife, Georgie, has left him, finally giving up on their lonely marriage. His son, Edward, twenty-four, fled six years ago, leaving behind a shattered relationship with his father. Edward understands that some things cannot be fixed, though memories of his domineering father still inflict pain. Then comes a frantic phone call: Luke has been gravely injured in a car accident with Edward's younger sister, Cara. Suddenly everything changes: Edward must return home to face the father he walked out on at age eighteen. He and Cara have to decide their father's fate together. Though there's no easy answer, questions abound: What secrets have Edward and his sister kept from each other? What hidden motives inform their need to let their father die . . . or to try to keep him alive? What would Luke himself want? How can any family member make such a decision in the face of guilt, pain, or both? And most importantly, to what extent have they all forgotten what a wolf never forgets: that each member of a pack needs the others, and that sometimes survival means sacrifice? 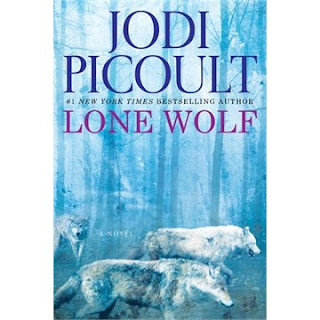 Another tour de force by Picoult, Lone Wolf brilliantly describes the nature of a family: the love, protection, and strength it can offer-and the price we might have to pay for those gifts. What happens when the hope that should sustain a family is the very thing tearing it apart? I've never read Jodi Picoult before but this one sounds interesting to me. Great review!